Hi Everyone! I have been away from the blog for awhile, a long while! I am sorry. This last year and a half has been full of changes, moves, illness, loss and joy. I am finally catching my breath and will be posting here again. My work CANNOT be purchased through Charm Origin, on CharmOrigin.com, or on Alibaba.com. They fraudulently use my photos on their websites to sell copies of my work. My original art pieces can only be purchased in my Etsy shop. It has been brought to my attention that there is yet another company that not only claims to make my toppers, but they have hijacked my pictures as well. 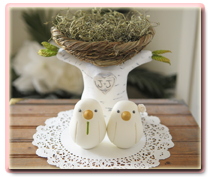 Please note: NONE of my toppers are sold on http://www.charmorigin.com Charmorigin has stolen my pictures and does not make the same toppers that I do, they use polymer clay. Mine are sculpted from all natural, paper clay. Please be aware, I only sell here or in my Etsy shop. Wow! What a very busy month it has been! We are currently taking orders for delivery in November and beyond. Who would have known things would be so busy here! Anna has been out for the last few weeks, so I have a stack of mail that has not been answered. If you are in that stack, please bear with me. I am working on getting it all answered. I will be taking a much needed break this Spring, not sure of the exact dates yet (I will keep you posted), but thinking March/April-ish. Mr. S and I will be heading to Arizona to visit the kids. If you will be wanting to place an order for that time, please do get it in by December/January. Our oldest Son and Daughter-in-law were just up visiting. It was wonderful to see them, but I really just could not spend as much time with them as I had hoped. I was very busy in the studio. Thank heavens Mr. S was home. Now everyone is gone and the house is very quiet. This is one of my favorite Northwest Bands! I am anxiously awaiting their new CD, until then, I will continue to wear out their old one! I love this group and I really enjoy listening to them while I am working away in the studio. I hope that you enjoy them, too! Real Wedding, RLS and Get Married Magazine! 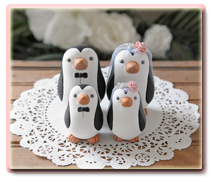 Last year we were contacted by Raquel to make a topper for her and Nathan's wedding. Their wedding took place in December, at Tampa's Lowry Park Zoo. We were so honored and were so excited to see the pictures. This wedding turned out to be so fun and unique!! It was beautifully captured by the very talented team at Kenzie Shores Photography. It is also being featured in Get Married Magazine's Fall Issue, on newsstands now. We are so excited! 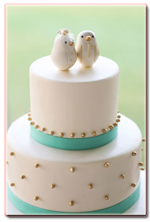 Here are the pictures of the topper on their cake! It was brought to my attention, by Heather at urastarhouse (Thank you, Heather!! ), that there is a person on Ebay that has placed a bogus ad selling my toppers. The seller has taken the pictures from my site, of a couple topper, and is selling them as a their own custom toppers! Grrrrr!! This makes me so angry! I have written to Ebay several times and the ad is still up (Sigh). I thought that I had better let you know, this is NOT me. I do not live in China and I DO NOT sell my work on Ebay. Currently I sell exclusively through Etsy or through contact from this blog. Here is the phony Ebay Ad Please do not be fooled and please flag this fraudulent seller! !